Tessa Trow and Josh Meckel, co-founders of Spokane VegFest. Behind the glass counter of Boots Bakery & Lounge on Main Avenue, the packed shelves hold a host of sweet and savory delights — curried lentils, minted fruits, pastries, greens and cakes. Despite every dish being vegan, meaning no meat or animal products, the options prove a colorful bounty. Tessa Trow sits at a table in the back, turning from her laptop to a plate of seasoned vegetable salad. A co-founder of the Inland Northwest Vegan Society, Trow rejects the popular impression that giving up meat means giving up a wide variety of meal options or tastes. "A lot of people think that being vegan is restrictive," she says. "I think the opposite." Most people might order a hamburger. She can order a black bean, lentil or beet burger. Many shoppers will pick up a gallon of dairy milk. She can pick from soy, almond, rice or others. "I have 30 types to choose from," she says. Most nutrition experts agree that a plant-based diet can provide significant health advantages, with research finding reduced risks of cancer and cardiovascular problems. Many vegetarians cite environmental impacts or humane animal practices as part of their decision to change their food habits. Much of American food culture still revolves around the perceived staples of meat and potatoes, but as the popularity of vegetarian diets has increased, local markets and select restaurants have shifted to accommodate them. 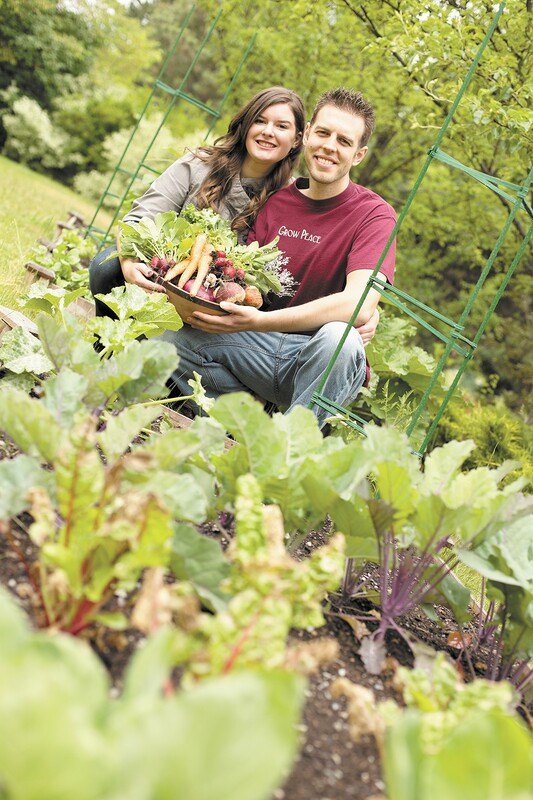 Trow and her partner, Josh Meckel, recently organized VegFest 2014 in Spokane to share their passion for vegan living. They believe Spokane is ready to embrace a new way of looking at food. "We were hoping for about 500 people to come," she says of June's VegFest. "We had 1,100. Our biggest complaint was that the venue was too small, which I take as a compliment." In her office at Providence Sacred Heart Medical Center, clinical nutrition manager Nicky Desmond lists a wide variety of health benefits linked to plant-based diets in recent research studies. Balanced vegan and vegetarian diets can dramatically reduce the risks of many common ailments. "Vegetarian diets are associated with lower cholesterol levels," she says. "They're associated with lower blood pressure, lower body mass index, lower cancer rates ... lower risk of developing type-2 diabetes, lower risk of hypertension." Some of the most compelling research comes out of Loma Linda University, where researchers have spent 12 years monitoring a sample of more than 73,000 Seventh-day Adventists, about half of whom adhere to a vegetarian-style diet. No other research has examined eating habits on such a large scale, and the results strongly support plant-based diets. The studies have found that Adventists, whose practices encourage vegetarianism and prohibit smoking or drinking, tend to live longer than others in the same area. Rates of high cholesterol, cancer, diabetes and high blood pressure all decreased as meat was removed from the diet, dropping from non-vegetarian to semi-vegetarian to vegetarian to vegan. Loma Linda's latest study, announced in June, finds the mortality rate for non-vegetarians runs almost 20 percent higher than that of vegetarians. Researchers suggest even slight diet changes can have health benefits. "The takeaway message," study co-author Sam Soret says in a news release, "is that relatively small reductions in the consumption of animal products result in non-trivial environmental and health benefits." Desmond says meat in moderation obviously can provide certain nutrients, but she emphasizes that meat does not have a monopoly on any vitamins or minerals. A balanced vegetarian diet can safely feed almost anyone from growing children to pregnant women. Modern vegetarian or vegan food choices offer plenty of protein, iron and calcium, she says. Many fortified products provide vitamin D or B12. "[But] just because a food label says 'vegan' or 'vegetarian' does not equate to health," Desmond warns, citing candy and chips. "As with most things in health, variety is key. It's important to be eating a variety of whole grains ... legumes, fruits and vegetables." Tarawyn Waters connects with customers at Thursday Market in Spokane’s South Perry District. When Jim Schrock sells his produce at Spokane farmers markets, he often gets a few surprised looks when he explains he grows and harvests his lettuce, tomatoes and other vegetables just two miles away. "Their eyebrows really go up," he says. Schrock owns the 38-acre Urban Eden Farm in the Vinegar Flats area of West Spokane along Highway 195. There, he and his partners strive for a low-input, almost closed-loop farming model, with hopes of a more efficient and sustainable operation. "It's a lot of shovel work," he says. "We use a lot of hand labor." Workers enrich the soil with local leaves and manure. Schrock says they rotate crops over the same land to cycle in fresh nutrients. Farming partner Tarawyn Waters argues that those deliberate practices make for better produce and a smaller impact on the environment. 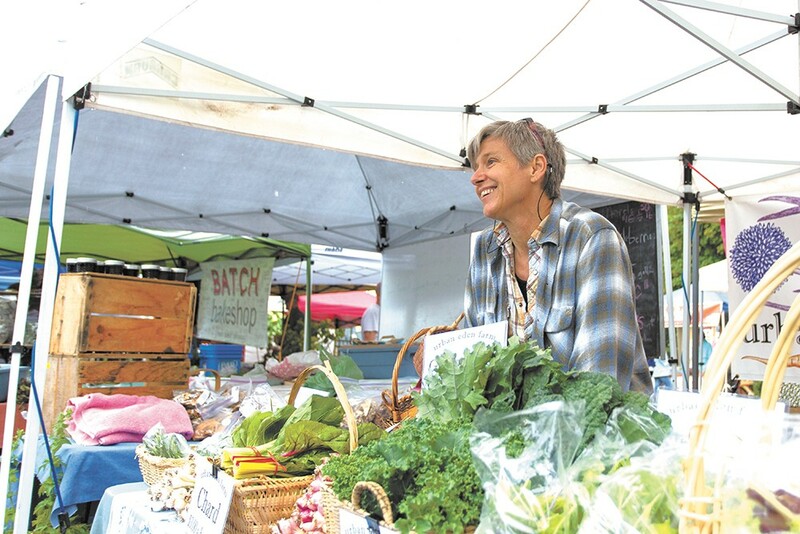 "As practicing organic farmers," she adds, "our goal is to produce food while establishing an ecological balance. ... We practice organic farming because it is better for the earth and every living thing on it." Vegans and vegetarians often cite the environmental benefits of a plant-based diets, and research supports many of those claims, but like almost any generalization, it's complicated. For his part, Schrock says he enjoys the opportunity to meet his customers and build a new connection. "They like to be able to look us in the eye and ask us questions," he says. "We can stand behind [our produce] pretty strongly." But support of organic farming and locally grown food can easily be embraced by meat eaters. The real concern for many vegetarians is the environmental cost of producing beef. Cattle emit methane, a problematic greenhouse gas, as part of digestion. A 2011 study from the Environmental Working Group concluded that beef, which makes up 30 percent of meat consumed in America, results in the equivalent of close to 60 pounds of carbon dioxide per edible kilogram of beef. Lamb and cheese also rated high on greenhouse gas emission rates. "While best management practices can demonstrably reduce overall ... environmental harm," the report states, "the most effective and efficient way to reduce greenhouse gas emissions and environmental impacts from livestock is simply to eat, waste and produce less meat and dairy." A report from the UN's Food and Agriculture Organization calculated that meat livestock contribute 37 percent of all human-caused methane. About 33 percent of the world's arable land is also used for grazing or feed crops. Many vegetarians also cite studies saying it takes 6 pounds of feed to produce each pound of beef — along with all the water, land and energy. The Loma Linda University Seventh-day Adventists study outlined significant reductions in greenhouse gas emissions from plant-based diets. The study found that semi-vegetarian diets resulted in 22 percent fewer greenhouse gas emissions while vegetarian diets saw a 29 percent drop, indicating even limited changes in diet could provide benefits. Research shows poultry and pork produce fewer emissions per pound, but still much more than most vegetables. However, a recent Washington Post analysis of an Environmental Working Group study notes that vegetables cannot just replace beef's caloric value, pound for pound. If foods are rated by emissions per calorie, the analysis found, beef still proves four times less efficient than tofu and 39 times less efficient than legumes, but some meats like pork and chicken rated similarly to popular vegetables like broccoli and tomatoes. Most animal advocates or vegetarians would suggest that meat lovers at least consider purchasing meat from small-scale, grass-fed cattle farms. Some research suggests such ranching operations practice more ethical animal treatment and may graze on land unsuitable for farming that would otherwise go unused. Such practices also avoid the cramped conditions of large feedlots. Other researchers, including Jude Capper of Washington State University, argue that feedlots provide more efficient livestock management, with a reduced impact on land and resources per pound of beef. Capper says modern lots have cut emissions and dramatically increased production in order to meet the world's growing demand for food. But environmental impact extends beyond production methods. Schrock says he saves in transportation costs and greenhouse emission impacts by selling close to home. His vegetables don't get trucked in from California or flown from the coast. He can harvest his produce in the morning, and with just a 10-minute drive, have his pumpkins, kale and carrots out for customers to enjoy. Waters says she finds many modern food production practices troubling. It's important to remember that food selection does have an impact. "Where you spend your money," she says, "is a powerful way to show what is truly important to you." Both Desmond and Trow have seen an increased interest in and openness toward vegan and vegetarian eating. As more people have embraced eating local or growing their own food, more co-ops and restaurants have supported vegetarian options. "It's never been easier," Trow says, noting that Spokane has embraced vegan living in many ways. "We could always do better. Most communities could always do better." For transitioning to a new diet, Desmond recommends trying a few meatless options at local restaurants. She says many know how to substitute tofu or remove meat from otherwise familiar dishes. Mexican fare, pasta and stir-fry also offer easy options for reducing meat. "There's just a whole plethora out there for vegetarian meals now," she says, citing Meatless Monday and other resources. Trow recommends the book Betty Goes Vegan, which provides vegan alternative recipes for many traditional American meals. She and others acknowledge that changing a diet can be a very personal decision that, in the case of veganism or vegetarianism, often impacts daily lifestyle or social situations. Such a diet may force a more contentious approach to eating, but it also can be rewarding, both physically and mentally. She encourages everyone to explore their own path, even if it takes baby steps. Boots Bakery has you covered from breakfast to dessert with vegetarian/vegan and mostly gluten-free dishes, like this one below. Here tofu gives you the protein you need to jump-start your day, while plenty of veggies help you feel full but not weighed down. 1. Whisk sauce ingredients together. 2. Pour over tofu and bake uncovered for about 35 minutes at 350 degrees. Alternately: cook tofu in a frying pan with the sauce. 3. Let sauce reduce by about half. 4. After the tofu is done, add cooked veggies and toss to coat. 5. Toss in greens to wilt them and serve warm. The White House Grill's Raci Erdem puts a lot of garlic in his hummus, but you can tone it down... or add even more! Hummus can be made ahead and refrigerated. Serve with warm pita or sliced veggies for a nourishing meal. Drain garbanzos but reserve liquid. In blender, mix garlic and salt. Add garbanzo beans, half a can of the reserved liquid and blend. Add tahini, lemon juice, canola oil and sumac and blend to a smooth paste. You can add a bit more reserved liquid from the garbanzos if the mixture is too thick. Cover and refrigerate. To serve, spread on platter and drizzle with a little olive oil. Garnish with lemon wedges and a sprinkling of chili powder.